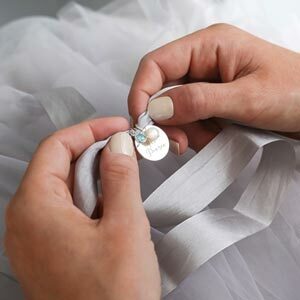 The Personalised Bridal Bouquet Charm is a beautiful sterling silver disc with a aquamarine birthstone and pearl charm, presented on vintage ribbon. Looking for your something old, something new, something borrowed and something blue? The Personalised Bridal Bouquet Charm is perfect for your bridal bouquet! The delicate disc charm is presented on a vintage ribbon that can be wrapped around a flower bouquet and comes with a beautiful aquamarine birthstone and pearl charm. Available in sterling silver, silver and rose gold, the Personalised Wedding Bouquet also comes with a fine chain that allows the charm to be worn and adored forever. Why not personalise the disc charm with special names, dates and messages? We have a variety of free gift cards to choose from to accompany your order as well as the option of luxury packaging with beautiful foil cards. 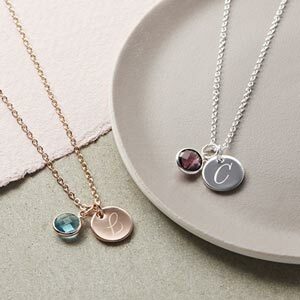 Why not upgrade your beautiful personalised necklace to Sterling Silver or Rose Gold Vermeil to make your purchase extra special? Sterling silver plated necklace and disc charm. Sterling Silver and Swarovski crystal birthstone charms. Sterling necklace and disc charm's are made from solid sterling silver or 14K rose gold plated sterling silver.